Good Bye Ouches and Grouches Hello Happy Feelings – Too many sads, bads and mads at your house? Too many pesky, annoying, baffling, depressing, maddening, bothersome and awkward feelings keeping everyone upset? Are your child’s out-of-control emotions making him or her and everyone else miserable? The real truth about feelings: Feelings are meant to be felt, then released! If people would learn to feel their feelings and let them go, there would not be so much acting out and hate in the word. Typical children’s problems are discussed as different parts of the personality with lightness and humor to help children understand themselves and want to change. The book teaches The Emotional Freedom Technique (EFT) which is a new, exciting, fast-acting approach to release negative feelings. 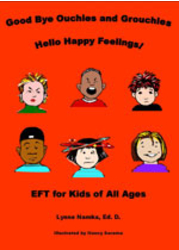 Acclaimed by therapists and thousands of people worldwide, EFT helps create a happier life.